I like my coffee. I’ll even admit to being a borderline coffee nerd. But I’ve never tried home-roasting. It always seemed like too much faff. Roasting in a stovetop pan or oven isn’t sustainable in my household, and using a modified popcorn machine is too “number 8 wire” for my taste. Plus, controlling roasting parameters is shrouded in mystery. I foresaw lots of time and effort to achieve mediocre coffee. The Kaffelogic Nano 7 roaster might just change my mind. I trialled a prototype and found it amazingly simple to use. It’s the brainchild of Chris Hilder, 4 years in development. You won’t find it in stores – on March 16, the first 100 units go on sale through a limited-time PledgeMe crowdfunding campaign. 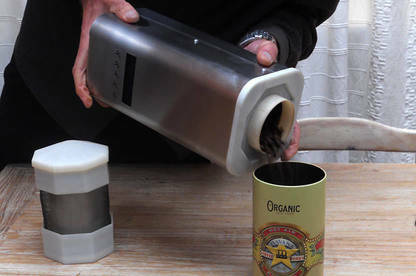 The Nano 7 is a tall, stainless steel box with a chimney on top and dimensions similar to a coffee grinder. Its chamber holds 120g of green beans and there’s a heating element, a fan and electronic controls. 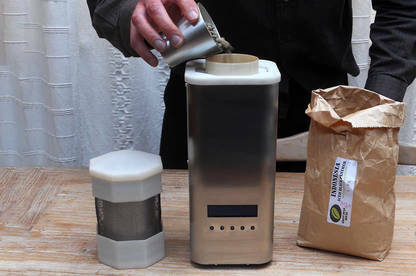 It produces 100g batches of air-roasted beans. The idea isn’t to generate commercial quantities, but to let you roast enough for a couple of days. The automated process takes 15 minutes from filling the hopper to removing cool, roasted beans. At the heart of the Kaffelogic machine is an electronic controller. The mechanics of roasting are simple: you heat beans to a particular temperature, then cool them down. The controller monitors temperature and adjusts the fan and heating element to produce desired rates of heating and cooling. You can create your own roasting profiles offline on a computer (the full nerd approach) or download pre-set ones from Kaffelogic (the plug-and-roast approach), transferring them to the machine via a USB port. There’s a middle ground too. I used a pre-installed profile, but then tinkered with settings to create lighter and darker roasts. I produced very drinkable coffee, ranging from a light floral bean ground coarsely and brewed as a pour-over, to darker beans (bordering on overdone) ground fine for espresso. With little knowledge of coffee roasting, I was able to create my own variations and no undrinkable or even mediocre brews. It’s a simple entry to the world of coffee roasting. Note – the PledgeMe product will have black trim, not white. As a bonus, you’ll save money roasting your own beans. My local supplier, Ripe, sells a range of single-origin green beans for less than half the price of the roasted equivalent. What else can I report? The fan is noisy – not as loud as a Nutribullet-type blender, but it goes on for longer. You’ll also need to get used to the smell of roasting coffee beans (my wife described it as “wet, burnt toast”). It makes your nose hairs curl. Chris recommends running the machine under a rangehood or next to an open window. The Nano 7 leaves no mess: the chimney did a fine job collecting chaff (the pale brown part of the bean that looks like tiny dried leaves and gets everywhere when you grind beans). The machine stays cool to touch throughout. Also, there’s a display that reports real-time roasting parameters. The Kaffelogic Nano 7 would be an easy way for a coffee nerd to get into home coffee roasting. I’d add one to my set-up if I didn’t live in Wellington, where I’m spoilt by having more than two dozen roasters on my doorstep. But even so, one night spent experimenting with the prototype demonstrated the appeal of creating my own roasts and blends. Chris is launching the Kaffelogic on the PledgeMe crowdfund platform. He’s offering the first 100 Nano 7 machines at a reduced price – $450 instead of the intended $800 retail price. Chris, like many other inventors who turn to crowdfund platforms, do so because they don’t have the funds needed to establish a manufacturing capability. Crowdfunding gives them a leg-up. The campaign also acts as an opportunity to gauge demand for a product, reducing the risk of investing a fortune in a product no one wants. Like most crowdfunding campaigns, Kaffelogic’s is “all or nothing”. Either the funding target is met within a set time, or the product is “unfunded” and they receive nothing at all. You won’t pay a cent until the end of the campaign, and then only if Kaffelogic hits its funding target. If it does, it means it (theoretically) has the funds to deliver your machine. The risk with crowdfunding campaigns is you’re not buying anything, except the promise – from someone you’ve never met – of a product that doesn’t yet exist. You never know if you’ll see a positive result until it lands on your doorstep. At least the “all or nothing” approach offers a safety net of sorts. 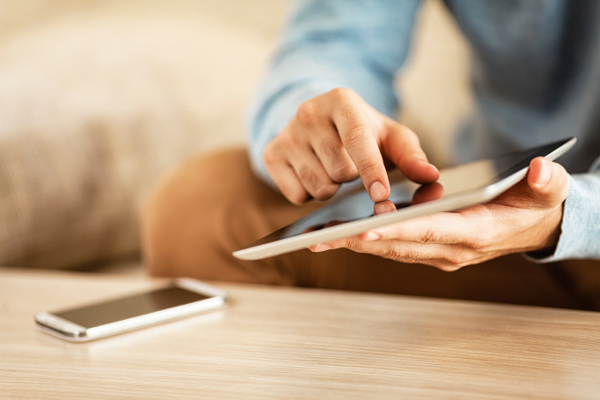 For many who back a campaign, it’s an opportunity to get in first on a new venture or become early adopters of innovative technology. With Kaffelogic, the trade-off for the discounted early adopter price, aside from the risks of crowdfunding in general, is that your Nano 7 will be hand-built by Chris, but with production-quality parts. Months or years down the track, if your machine goes wrong, you’ll need to chase Chris for help. It isn’t as if you can pop along to your local retailer, Consumer Guarantees Act in hand, and walk out with a remedy. The prototype Kaffelogic Nano7 was loaned to the writer by Chris Hilder.